What drove Tim to keep going after that first jump: Chrysler Concorde, which I crashed into a mail truck on the way to my second jump. Some people would call that a sign not to continue. I got a rental car. Why Tim says you should try skydiving for the first time: It’s the most fun you will have with your clothes on. Part of owning a drop zone that people may not expect: Frogs live under the hangar door. Definitely didn’t expect that! What drove Brandi to keep going after that first jump: I had a lot of support from my instructors and coaches and they made it easy. Not getting my license wasn’t even on my radar as an option. Why Brandi says you should try skydiving for the first time: Skydiving has something to offer everyone. I hear people all the time that come out to jump and are so scared and they are without question ALWAYS the ones that rave about the experience. Now not everyone is going to make a jump and far fewer will actually become skydivers…but I wish everyone would give themselves a chance to have that moment that can change everything. There are very few of those moments and those experiences out there. Part of running a drop zone that people may not expect: Keeping your instructors fed and watered and manifesting students/instructors with compatible personalities in mind is really important. You want the students to have the best possible experience so knowing your instructors and getting a feel for who your students are and what they need goes a long way. When training our new manifest staff I tell them that it’s all about embracing the controlled chaos. I skydive because from the moment the door opens at 10,000ft until the time your feet touch the ground again…you are 100% in the moment. You aren’t thinking about things that happened yesterday or what you need to do tomorrow. It’s a freedom that I’ve never found in anything else I’ve ever done. It lets you push limits and challenge yourself but it also lets you relax, enjoy the view, be goofy with your friends and just feel the joy of the moment. Skydiving changed the way I thought about life in a lot of ways and it made me realize that there really isn’t anything holding anyone back but their own thoughts and fears. It changed the entire plan I had for the course of my life. I’m not doing anything remotely the way I thought I would be 10 years ago. Within six months of making my first skydive I was working for the dropzone packing tandem parachutes. Within 18 months of that I had quit my job at the daycare I’d been working at to work full time at the dropzone. I graduated with a degree in elementary education and promptly decided that I would rather run a skydiving company and teach skydivers. I love my job, I love the company I work for and our DZO. I can’t imagine going back to a 9-5 job. I get to spend every single work day with people that I really care about. I get to help introduce people to one of the best experiences they will have in their life. First jump: My first jump was a static line military jump on June 5, 1990 at Airborne school, Ft. Benning, GA. My first sport jump was May 25, 1992 at Son DZ at Ft. Campbell, KY.
Brian’s words to live by: What could possibly go wrong? Describe Brian Piper in 5 words or less: Father, husband, student of life. The most badass thing Brian can do in the air: Four second canopy rotations are always great…when they’re smooth. But I think the ability to carve, head down around freefly or relative work formations to shoot video is probably one of my favorite skills. As much as I love the feeling of stepping out of an aircraft, as much as I love flying, I have to say, what has kept me in the sport for so long is the people. The skydiving community is filled with such a diversity of people, from so many different backgrounds, all around the world, who all share a similar passion. I’ve met some of the most amazing people through skydiving and it really becomes like a second family. No matter how long you’ve been in the sport, or how many jumps you’ve done, there are always new things to learn, new disciplines to try and new people to jump with. I love being able to be a student again and start from scratch. I also love being able to help new jumpers come into the sport. There’s nothing like taking someone up on their first tandem, taking them through AFF, watching their progression as a student and have the opportunity, at the right time, to keep introducing them to new aspects of the sport, from wingsuiting to CRW to instructing. Skydiving helps me keep things in perspective — stepping out of the plane forces you to focus completely on what you’re doing in that moment, forgetting anything else on your mind. 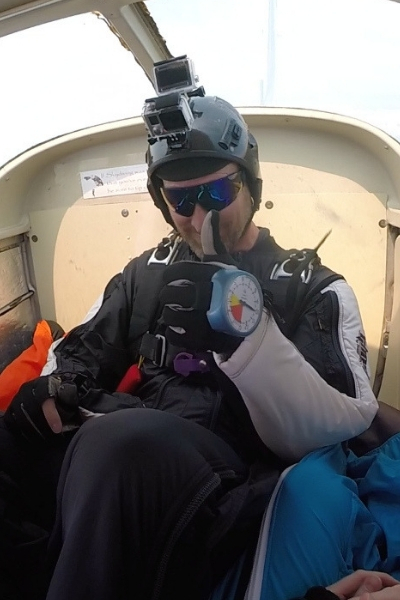 Skydiving also forces you to make smart, split second decisions with huge consequences. That translates to all other aspects of life. My greatest life achievement is the family I’ve helped build. Having found a supportive partner and soul mate, who constantly encourages me to pursue my passions is the key to being positive. Raising our kids and trying to be a good example for them, so they can see the importance of making every moment count, is something I try to focus on every day. As far as my best quality? With six kids…probably patience. 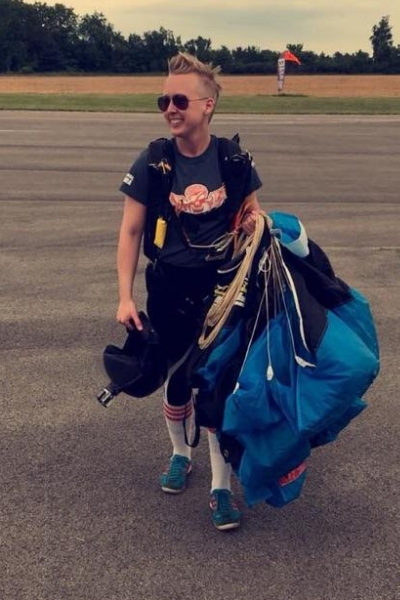 What drove Brittany to keep going after that first jump: The never ending challenges and goals that can be pursued in skydiving. The most valuable lesson Brittany has learned since that jump: Risk vs Reward is the most important concept to having fun and keeping yourself safe. Future skydiving goals: to become fully rated and work full time in the sport. And to eventually compete. 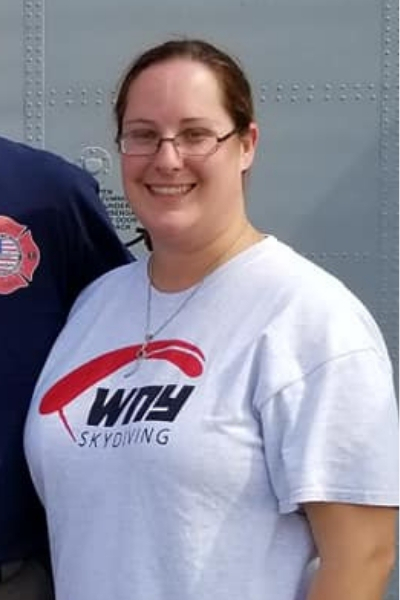 Why Brittany says someone should try skydiving for the first time: Because there’s no comparison to anything you’ve experienced on the ground that can explain what skydiving feels like, so you’ll never know if you like it or not unless you try it! Through skydiving, I’ve gained a certain fortitude in how I approach my aspirations and goals, and I’ve learned a lot of discipline and focus. My love for skydiving and absolute inability to live without it in my life has taught me to prioritize what is important and go after what I want 100%. I’ve also gained an incredible amount of self confidence and trust in myself, because when you are jumping from a plane wrapped in a wingsuit for the first time, and you have no idea how to fly a suit you can barely walk in, you learn that sometimes you just have to go for it and trust in your ability to make things work. And that confidence translates to all parts of your life. I skydive because it’s where I feel most natural. Everything about skydiving speaks to who I am and what I love. The familial nature of drop zones, the excitement of the jumps, the variety of experiences you can have from one jump to the next, the way you can set goals for yourself and never run out of new ways challenge to yourself, even after achieving the goals you set. There are always new things to learn and accomplish, and new ways to have fun. Real life occupation: Claims Liability/Litigation Manager for a regional insurance carrier. Why Chad says you should try skydiving: Because after you land the sky is bluer, the grass greener and you are never the same; always better. My greatest life achievement is my daughter Haley — she is without a doubt the best thing about me. Friends and acquaintances are often surprised that I am a skydiver while raising a little girl, they sometimes find it reckless or selfish. I couldn’t disagree more. She experiences the sport with me, at the dropzone on weekends she has even helped pack a parachute and helps hand out forms. She gets to grow up in a world where people pursue their passions, in a culture where there is no bullying or judging and where the setting sun is generally the only limit to a days worth of adventure. Whether she ever jumps or not is unimportant; that she pursues her dreams and the things that make her whole is a lesson I hope she takes away from me and growing up around skydiving. Though I must be honest, she often teaches me more life lessons than I can hope to teach her. The most valuable lesson I’ve learned since I’ve started jumping is that life is about living and pursuing those things that you are passionate about and make you feel most alive. Nobody says, on their deathbed, that they wish they worked more, watched more TV or sat on the couch more. Get to living! The most valuable lesson Chris has learned since that jump? Never become complacent. Treat every skydive for exactly what it is, you are about to jump out of an airplane. Chris’s words to live by: Enjoy every day! 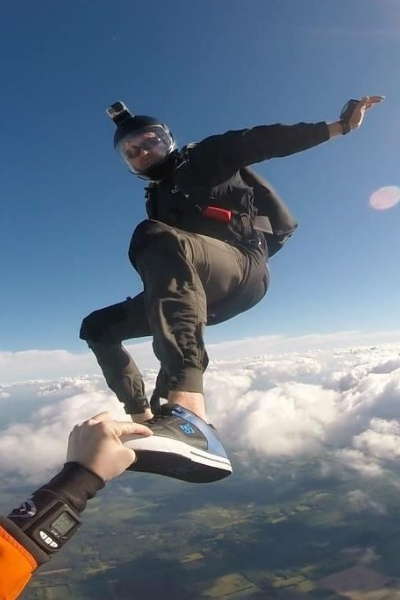 Why should Chris says someone should try skydiving for the first time: It is an experience like no other that will bring a new perspective to the sky and the ground they live on. However it is a decision that they do need to make for themselves. The most badass thing Chris can do in the air: Being able to work with and take people that significantly outsize me on tandem jumps, people that would not necessarily be able to jump if it weren’t for jumping with a relatively light tandem instructor like myself. When I saw that parachute open above me for the first time I was hooked. Skydiving has brought me tremendous joy, not only on the days I’m participating but also on others when I am reflecting on the past jumps and looking forward to my next ones. I will always cherish the phenomenal people that I have met in this sport, who tend to have a different outlook on life than most of society! It is also a great conversation starter on a job interview. I skydive because I love introducing people to the sport. My goal is to continue enjoying this the way I always have and to continue introducing other people to this great sport for as long as I am physically and mentally able to. It is the best outlet from daily life that I have found so far! 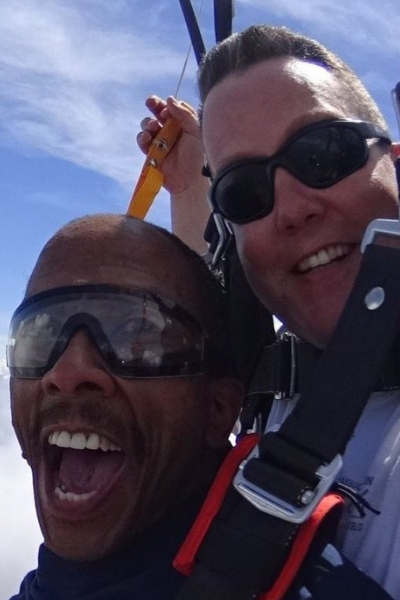 “Real life” occupation: Pastor & Professional Skydiver, retired teacher and farmer. First jump: at age seven leaping from our barn roof with a tractor umbrella, but my first jump out of an airplane was in May 1976 while attending Penn State. What drove John to keep going after that first jump: The love of flight and the thirst for adventure kept me skydiving. The most valuable lesson John has learned since that first jump: Respect the risks of sport: Pack slow, fall stable, and pull high. John’s words to live by: Live every day to your fullest potential. 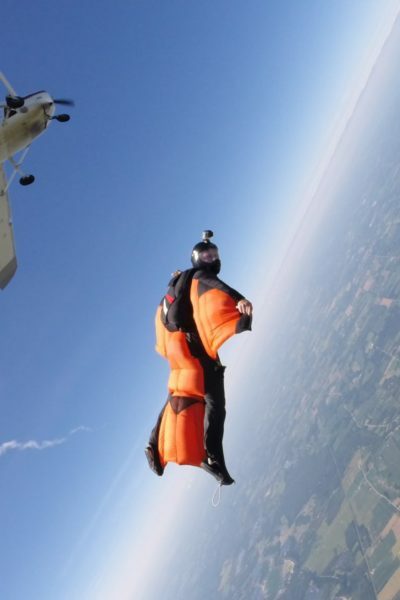 Why John says you should try skydiving for the first time: To challenge their perceived limitations and expand their personal potential by experiencing the ultimate thrill in the sky. When you have participated in an activity that few dare to such as skydiving one develops an earned sense of confidence and self respect by overcoming natural fear as well as producing an iron clad positive can-do, never quit attitude towards life. Stepping out of that old DeHaviland Beaver as a wide eyed nineteen year old forty-one years ago was a major step in building my character to accomplish more things in my life than I could have ever dreamed of and survive more adversity than one man should bear. It is not just a skydive or a sport, it is a life changing activity. I skydive because I love flying and enjoy experiencing God’s beautiful creation from the sky. 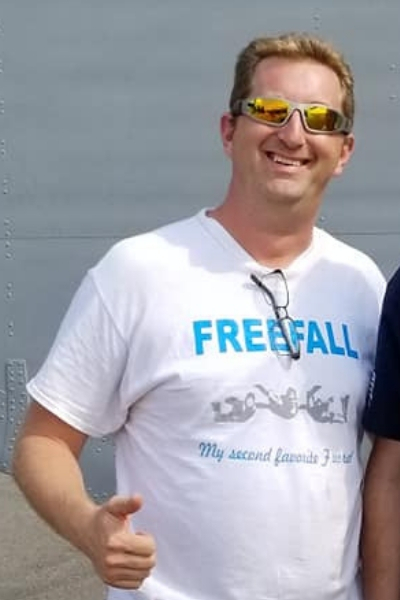 The things I like most about the sport are seeing the smile on the face of someone who has completed their first jump, the universal camaraderie among skydivers, and life long friends. My greatest life achievements in skydiving would include developing protocols for and producing the first sanctioned tandem exhibition skydive in the US, maintaining a perfect safety record as a DZO, and overcoming severe spinal injuries from an auto accident to skydive once again. 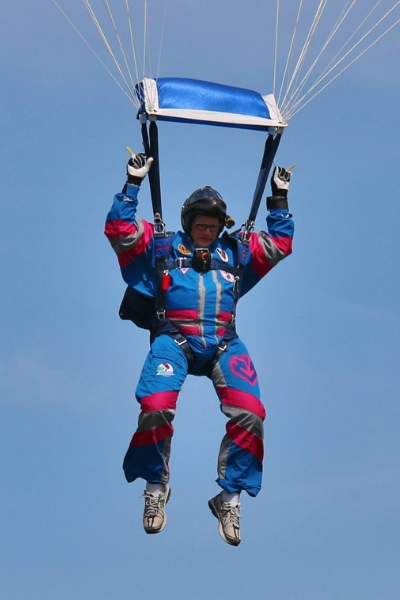 Over the 40 years I’ve been in the sport there has been a dramatic evolution of parachute equipment and of the sport itself which is now a diversely disciplined and consistently safe recreational activity for most all to enjoy. My favorite changes in the sport include the technological advances and standardization of equipment as well as the implementation of the Integrated Student Training Program. My continuing goals are to complete the remainder of my Examiner ratings to better facilitate training new generations of skydivers as well as refining and promoting exhibition skydiving. What is the most valuable lesson you’ve learned since that jump? If someone with more experience than you is giving advice, hear them out. Words to live by: Only the mediocre are always at their best. How has skydiving changed you in the rest of your life/changed your outlook on life/changed how you approach the rest of your life? Skydiving has shown me that, if you are willing to take the time, be patient, and open yourself up to constructive criticism, you will achieve awesome goals. Skydiving has a way of teaching discipline that is rarely seen elsewhere and I like to think I am a better person for it. What drove you to keep going after that first jump? Skydiving was an addiction from the first jump; something I had to do again (and again). The need to jump never goes away, which is why I call it my drug of choice. What do you like most about the sport? Comradery. You could leave your home dropzone for years and be welcomed back with open arms. I skydive because… It is the only thing I want to do, period. 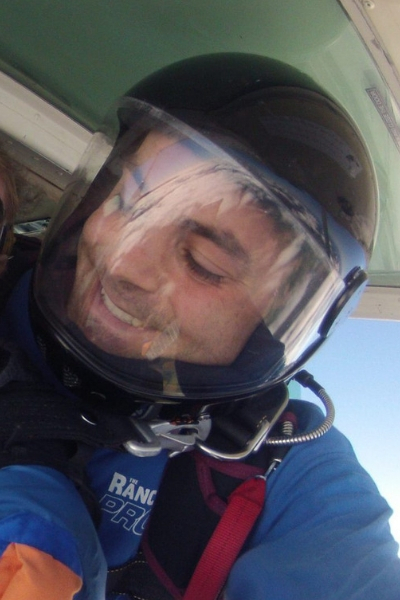 While others have found their solace in fishing, surfing, or running, I found mine in skydiving. What do you consider your greatest life achievement – or- best quality? I was able to buy a house, marry my dream girl, travel to over 25 countries, and make my addiction that is skydiving pay for itself all before the age of 30. Why should someone try skydiving for the first time? There is no other feeling in the world that compares to skydiving. It cannot be explained and is guaranteed to change your life. Future skydiving goals: To never stop learning and improving my skills. Why Mike says someone should try skydiving for the first time: Because it’s one of the few experiences that truly affects you for a lifetime. What Mike considers his best quality: Tenacity. The most badass thing Mike can do in the air: Take someone on their first skydive!!! Skydiving has taught me to put the things in my life in perspective. Little things don’t matter as much after a jump. I skydive because it’s fun, exhilarating and relaxing all at the same time. I kept going after that first jump because I wanted to learn more about the sport. I love everything about skydiving.